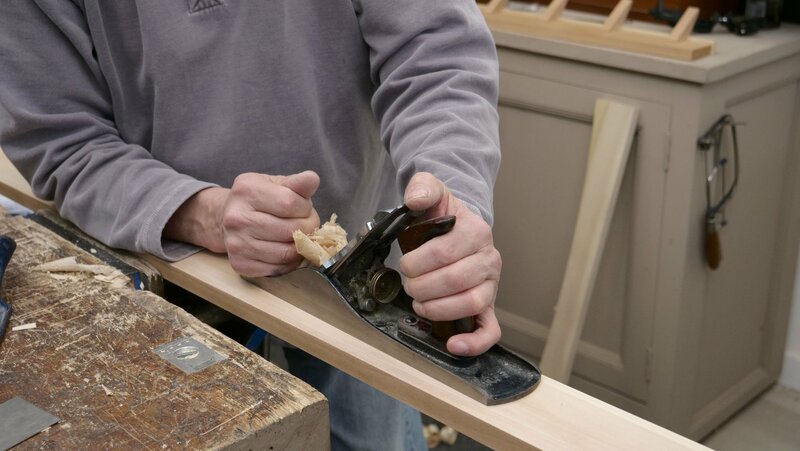 Note: When the plane is in between being used, Paul recommends that you should keep it upright with the blade against the benchtop. 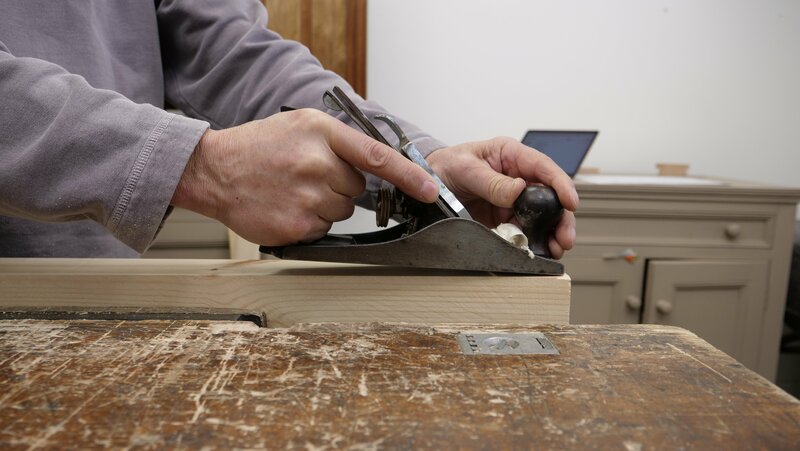 Contrary to popular opinion, this way is not considered the norm as they often used to teach in schools to lay it on its side, this was thought to protect the blade from being placed upon other tools and damaging it. 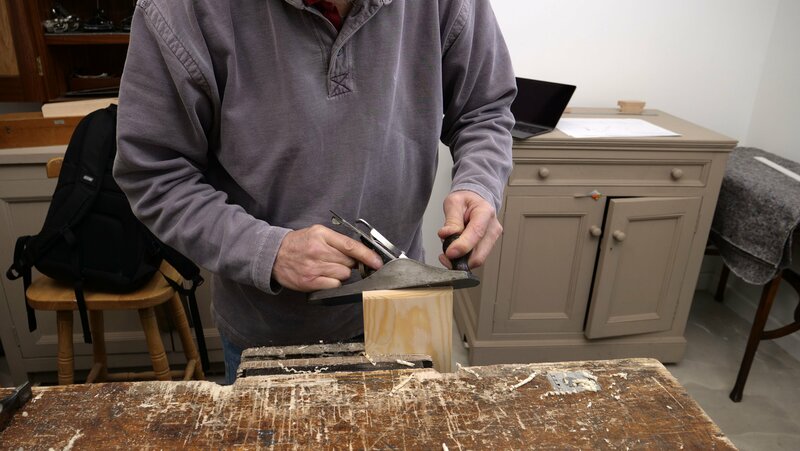 Paul has found that it is less likely to get damaged if the blade is not exposed, also as it is placed upright it is always ready to be used too. When holding the plane, use your dominant hand to grip the back handle, with your index finger in line with the plane. Put your dominant foot back, transfer your weight from your back foot to your front as your push the plane along the length of the wood. Your stance is really important as it will allow you to use your body weight to push the plane forward. 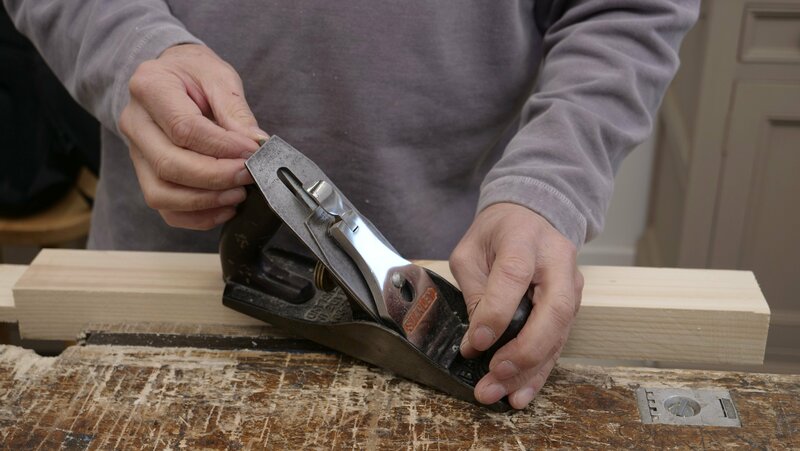 Make sure your stock is tightly secured in a vise when you push against the surface, so it will withstand the pressure. After each pass, turn the adjustment wheel clockwise until it touches the wood. 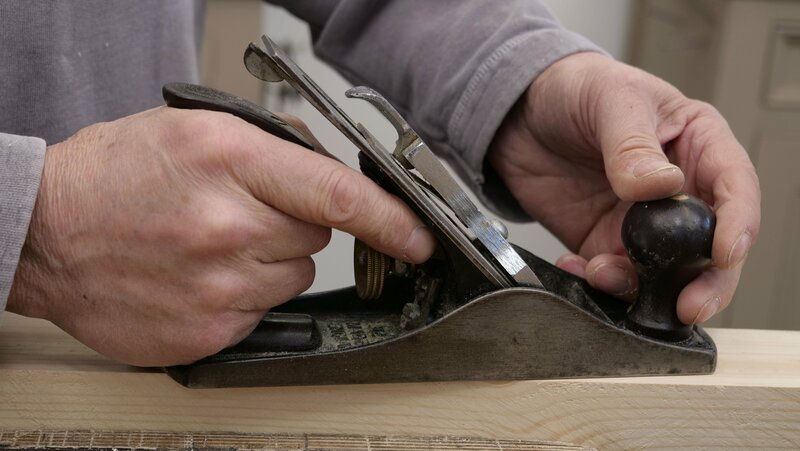 Test this by taking shavings on the left and right side of the blade, move the lateral adjustment lever a tiny bit at a time until even shavings appear. 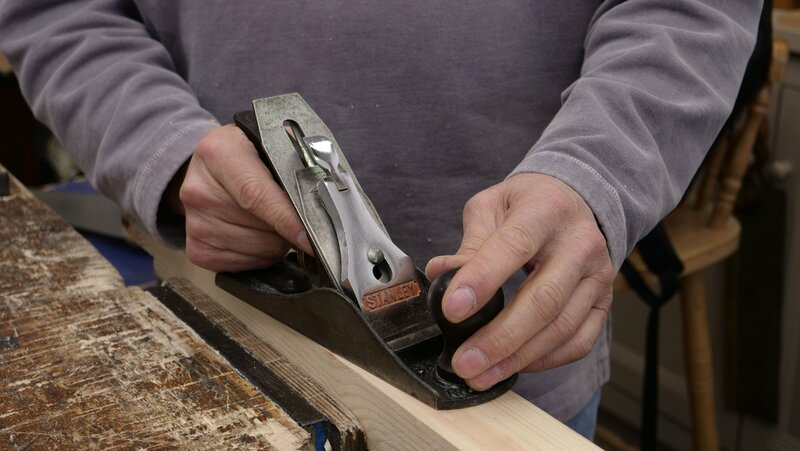 Keep the front of the sole registered on the wood, slightly lift the heel on the return pull. 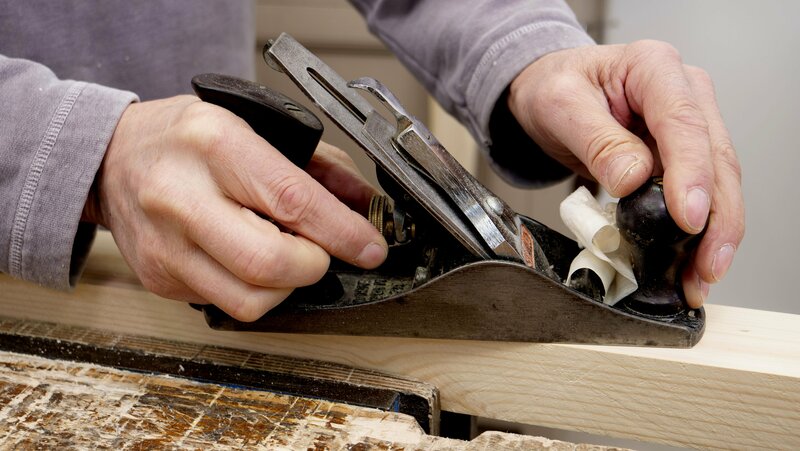 If you are finding it too hard to push, ease the blade off a little (by turning the adjustment wheel counter clockwise) and take off smaller shavings, this will take slightly longer but requires less strength. When you hear the blade drop off the end of the wood, you know you are at the end of your stock. 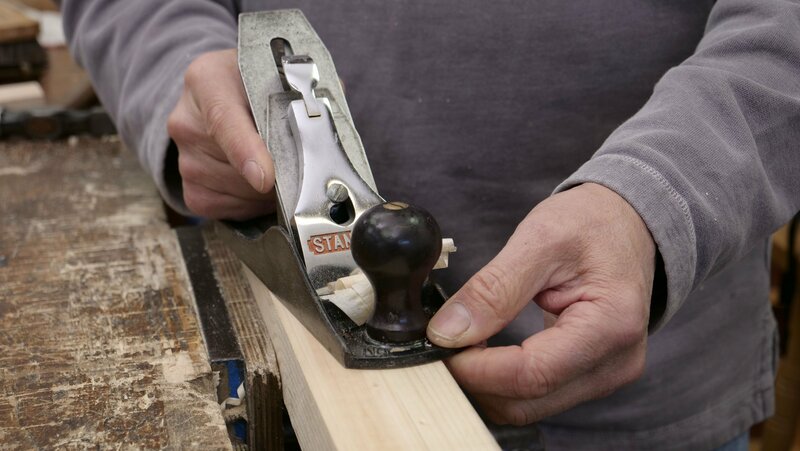 Make sure you don’t lift off the wood until the shaving has come away from the wood otherwise you will be left with what is called a ‘step down’. 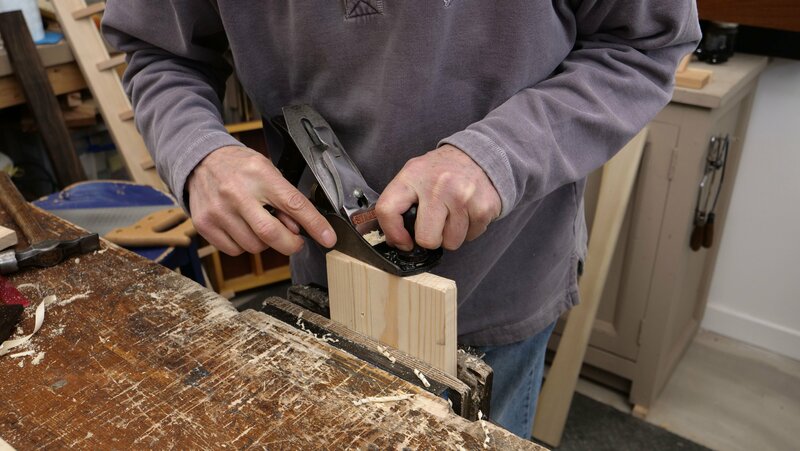 When planing the large face of the wood, start halfway and work from the left to the right, then drag the plane back to the end and do that second half from left to right. 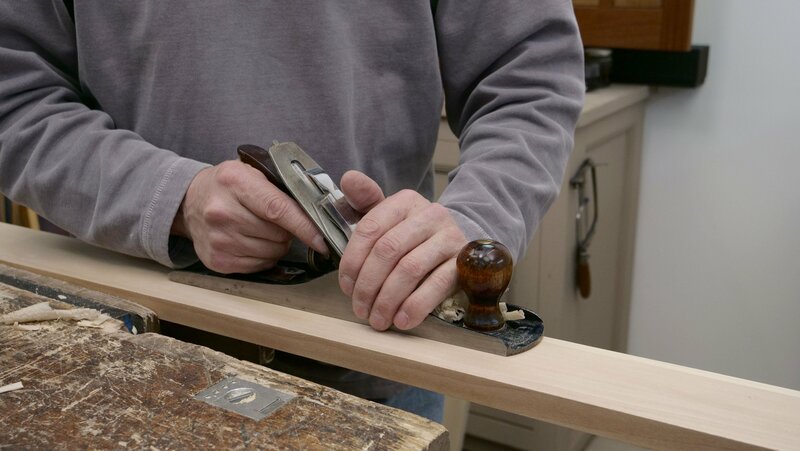 Use your dominant hand on the back tote and your non-dominant hand on the front knob. Point your index finger forward, you can rest this on the back of the frog. You can use your non- dominant hand as a fence to guide the plane. You can put your hand over the top of the plane instead of using the front knob, keep checking the throat is not clogged. By keeping the fore part registered and lifting the heel, it reduces friction and is more effective. 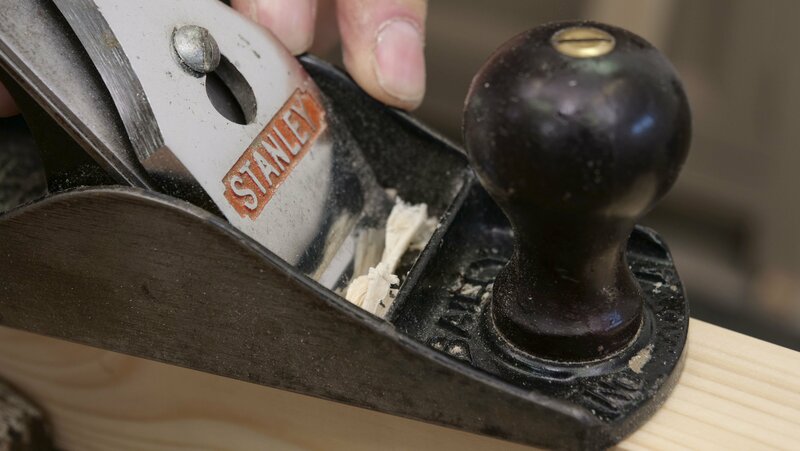 This determines how deep the plane will cut, keep turning this slightly until you get the desired depth. This can be moved side to side to adjust each side of the blade so you can get an even cut. This can happen often if you do not remove excess shavings while you are working. It is good to get into a habit of removing these as you go along. 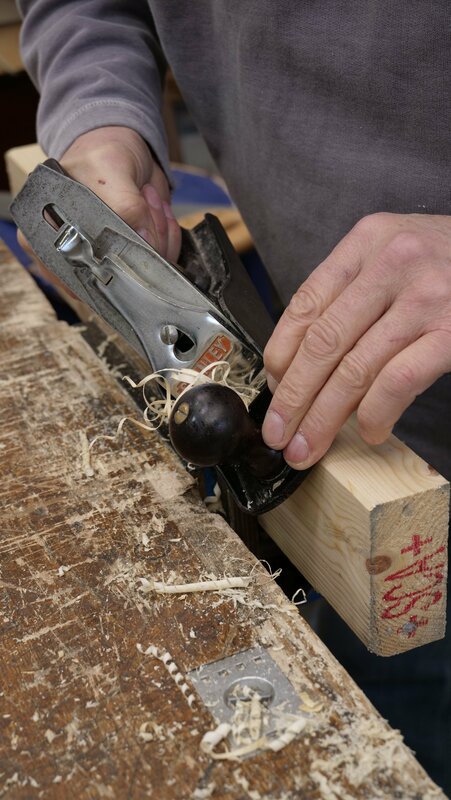 Wood is not always sold flat so it is important to check this before starting on your project, this can be flattened using a plane. 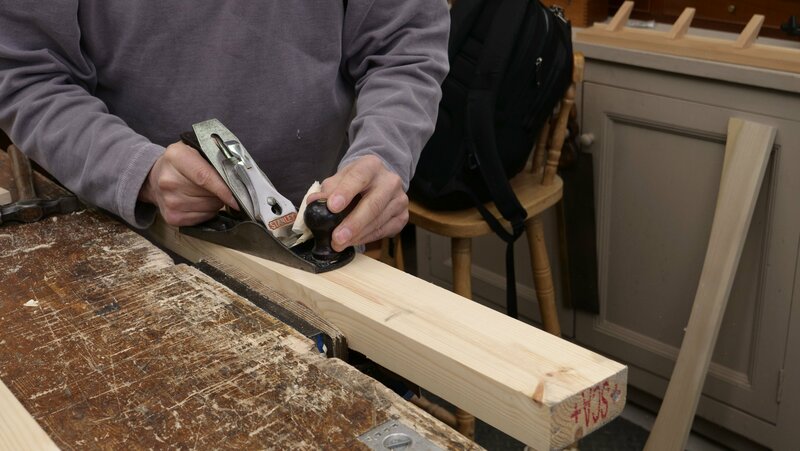 The plane can be used at different angles to create a curved edge. 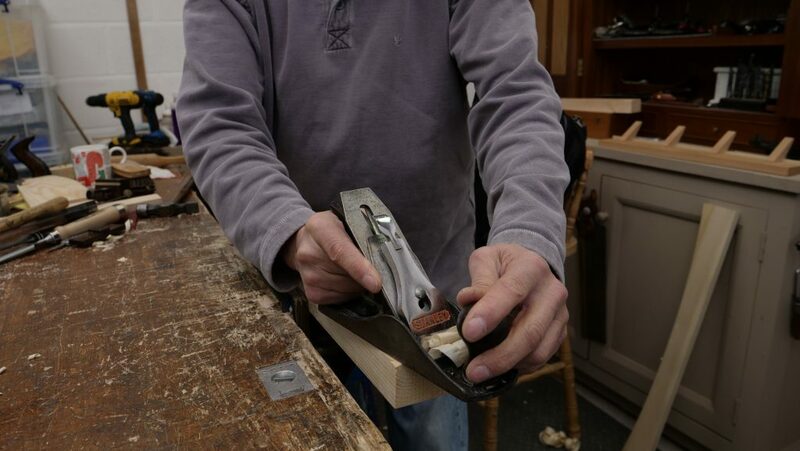 A sharp plane set to take very fine shavings can be used to plane the end of wood grain. This can be used to remove the sharpness (arris) of a corner. 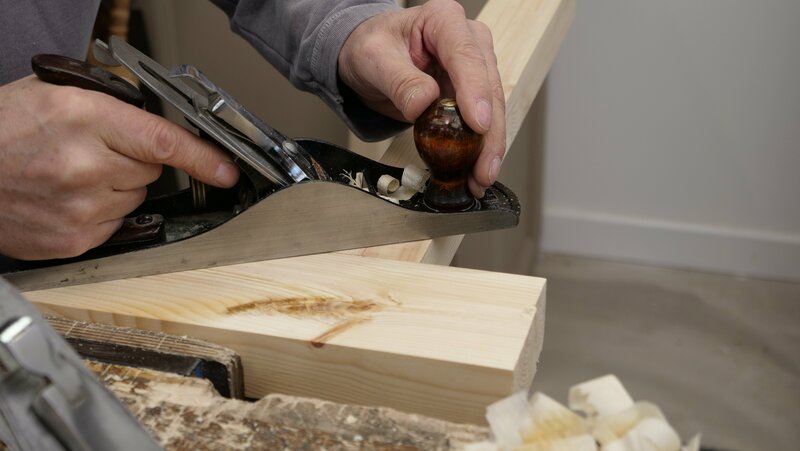 The plane can be used to level out any protruding material to ensure the joint surfaces are flush. Sometimes you can't get your body into the right position to allow you to drive the plane forward so it can be used on the pull stoke instead.